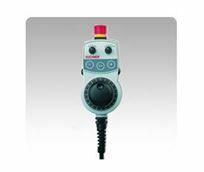 Hand held control devices allow tasks such as machine setup, troubleshooting and maintenance to be performed at the point of operation. Their durable, light weight, ergonomic design provide for years of service even in harsh environments. The features outlined below provide a high level of safety and versatility.